Immerse yourself in all the distinct charm of West Texas, savor some seriously delicious food, and rejuvenate your body and mind at the Quarter Circle 7 Hotel. 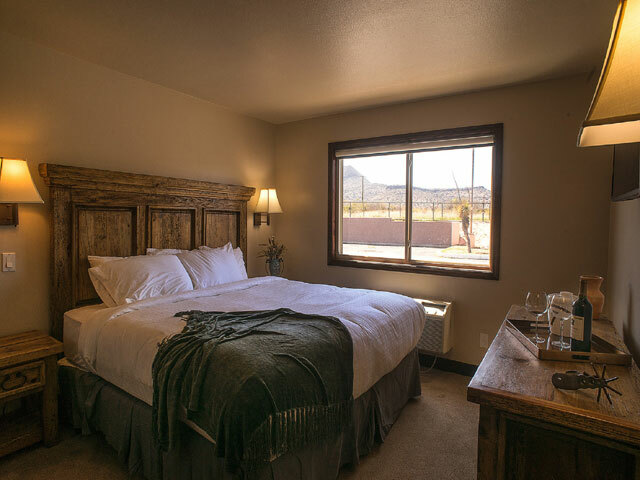 Located within glorious view of the mountains of the Chihuahuan Desert on the western edge of Alpine, this hotel offers a Texas-sized serving of comfort and luxury. From its suites appointed with western-style art and custom wooden furniture to the full-service spa, this West Texas hotel is luxurious and comfortable. Whether you’re looking to explore the Big Bend region or you want somewhere to get away, look no further than Quarter Circle 7 Hotel. Along with its cozy guest rooms and upscale amenities, Quarter Circle 7 Hotel is wheelchair accessible and has indoor and outdoor venues (as well as catering services) for weddings and events large and small. Discover Quarter Circle 7 Hotel’s amenities and services below and book your next stay here.